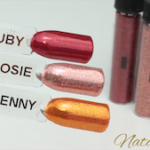 There are 40 glitters currently in the range from Magpie Beauty, and the range of affects includes what I would refer to as Standard Glitters, Holographic Glitters, Iridescent Glitters and Multi Glitz glitters. In case you aren’t aware of the differences I’ll give a quick run through of how I would describe them. Standard Glitters – A fully opaque foil/mirror effect glitter available in a range of colours but no additional affects. *Fully Opaque = The colour of the polish underneath can only be seen through the tiny gaps between the glitter flakes. Holographic Glitters – A fully opaque foil/mirror effect glitter that produces a 3 dimensional (3D) rainbow image when the light catches it, much like a disco ball. 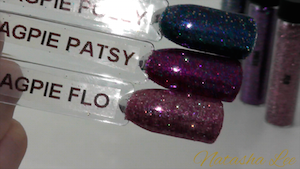 *Fully Opaque = The colour of the polish underneath can only be seen through the tiny gaps between the glitter flakes. Iridescent Glitters – A semi transparent coloured glitter that produces luminous colours that seem to change from different angles. 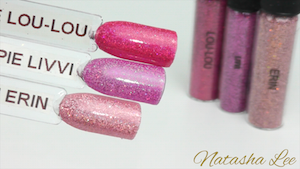 Due to the semi-transparency, these glitters can show the colour of the polish underneath but depending on the colour of iridescent glitter used, they can be used to alter the final colour and effect. e.g. Using a pink iridescent glitter over a dark blue or black polish can create an amazing “mermaid” effect. 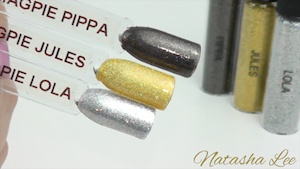 Multi Glitz – These are an opaque mix of different colour and effect glitters. e.g. standard and holographic flakes in difference colours mixed together to give a 3D effect nail. 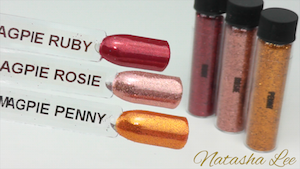 There are 13 Standard glitters available from Magpie glitter for nail art. 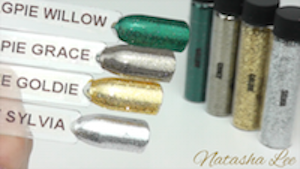 There are 12 holographic glitters available from Magpie glitter for nail art. 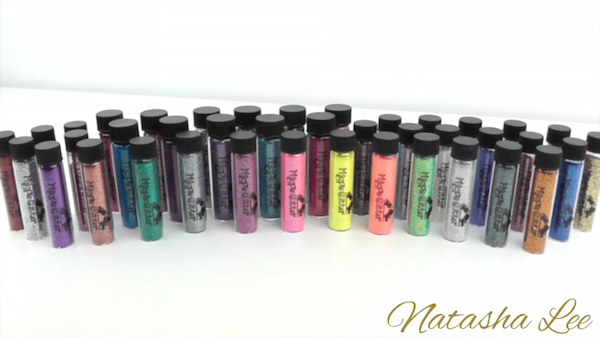 There are 12 glitters in the iridescent range from Magpie Glitter for nail art. 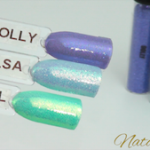 Lilly – THE most amazing mother of pearl/opal effect white glitter that I have come across! 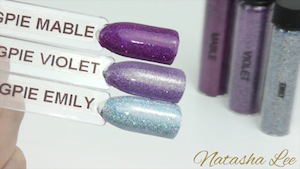 There are 3 colours in the Multi Glitz range from Magpie Glitter for nail art. Overall I’m massively impressed with the ultra fine Magpie Glitters for nail art. They apply beautifully, are a reasonable price and pleasantly, are also available to non professionals. 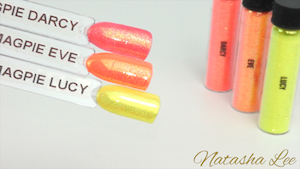 I love the holographic range and the neon iridescent colours have a real “WOW” factor. I like the effect of the different sized flakes in Goldie and Pippa and would love if they brought out some more of these in the holographic range. Of the 40 glitters, there was only 1 which I was a little disappointed by and that was Pixie. It looks absolutely sensational in the tube as a white with a real punchy violet tone when the light hits it. However, when applied over a pale polish like a white or a sky blue, the glitter itself takes on a yellow tone which isn’t hugely noticeable, but I am rather a perfectionist so I did notice it. With that aside I would still score these glitters incredibly highly. Over the coming months I will be trialling and reviewing some other big names in the professional nail glitter arena and bringing the comparison and results to you. 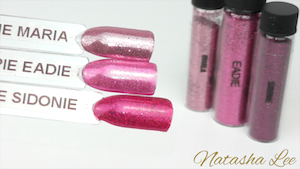 However, in the meantime I would score the Magpie Glitters for nail art a resounding…. If you’d like to watch the glitters in action to appreciate how sparkly they really are please see the video below. Magpie Glitters for nail art are available to purchase from www.MagpieBeauty.co.uk (professional and consumer) and www.thecreativebeautygroup.co.uk (professional only).